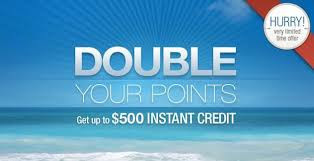 We are excited to announced new Sandals Signature Guest triple & double points promotions, effective Monday May 20, 2013. MAYTP13 is valid on new bookings made between the dates of May 20, 2013 – August 15, 2013 for travel May 20, 2013 - December 26, 2014 on stays of 5 paid nights or longer in a qualified room category at Sandals Emerald Bay, Sandals La Source Grenada, Sandals Montego Bay, Sandals Royal Caribbean, Sandals Royal Bahamian, Sandals La Toc, Sandals Negril, Sandals Grande Riviera Resorts. The maximum number of points that will be tripled is 10,000 points. Combinable with other resort offers, but non-combinable with other point promotions. *Please, note that past guests who sign up for SSG, will be able to use enrollment bonus points towards the offer, but they do not get to use the points from their current stay. Non-combinable with other points offers. Not applicable to groups. This offer is capacity controlled and can be withdrawn without notice. Not responsible for omissions or errors. All non-SSGs on resort who wish to enroll in the Sandals Select Program and book using the promo should be allowed. All existing bookings who wish to take advantage of the promotion must not be cancelled but labeled with discount code MAYTP13T.